Dave brings out the hits early, playing a favorite of his own, “I’m Not Like Everybody Else” — and “All Day and All of the Night” by The Kinks. The audience knows the words to these songs, of course, as they do with “She’s Got Everything” — a well-regarded song released on a single back in 1968. Dave’s distinctive guitar sound is truly front and center on “She’s Got Everything,” a garage rock sound popular decades before bands like The Strokes and Jet brought the style back to the ears of the masses 14 years ago. Dave’s voice is consistent and steady, and the years have imparted a sense of wisdom to his vocal stylings these days. Of course, Dave treated the audience to a good deal of solo material as well, recently having released two solo albums in the past year or so — a studio album, Ripping Up Time, and a live album, Rippin’ Up New York City — Live At The Winery NYC. Dave’s solo career truly began when he released the single “Death of a Clown” in 1967, and he treated the Howard Theatre to a performance of it Tuesday, much to the crowd’s approval. Dave introduced the audience to his girlfriend Rebecca G. Wilson, who sings the famous backing refrain of the song with “la la la.” The feminine touch adds a bit of mystery to the dark psychedelic tune, which is well received by everyone singing along. Reminding us that his recent material also showcases memories lost, Dave sings “Front Room” — and the song elicits nostalgia for times passed in a favored room of a house. 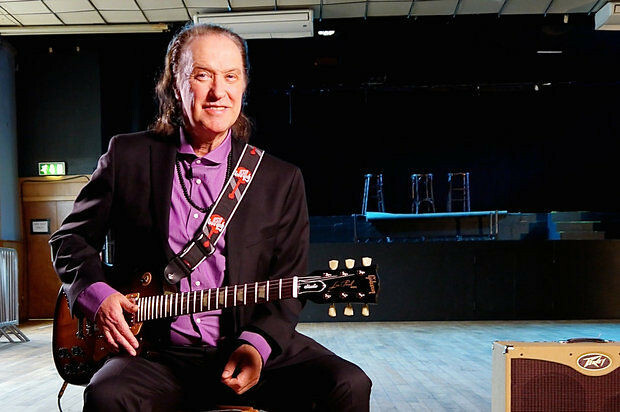 But it also highlights a modern Dave Davies — a man who embraces his past and invites the audience along warmly to “enjoy a cup of tea” made better by sharing the warmth of the memories in the room. Why, is Dave slyly referring to all of us now, together in the Howard, listening to his songs, many of which were written decades years ago? I don’t know what I was expecting when I walked in to experience my first concert with Dave Davies, but I’ll tell you there’s no finer gent with whom to sit down and enjoy a cup of tea (or in my case a beer) and feel songs of the ages settle upon me like a comfortable old leather jacket. It still feels pretty hip when you look at it! Dave has a few US tour dates remaining this year — tonight he’s back in New York City to perform once again at the City Winery and he has some dates in the northeast and then California before returning to England in December. Make it a priority to see the old chap while he’s being so active. After all, if he reunites with his brother and The Kinks soon, their shows will be a far less intimate affair than what you can experience now — sitting down with a master in an old room to relive some good memories and to make a few new ones.